G. W. Hart is tired of waiting for his seven grown sons to marry, and now he may not live long enough to see grandchildren born. So he sets an ultimatum for each son to marry before the end of 1874 or be written out of his will. But can love form on a deadline? 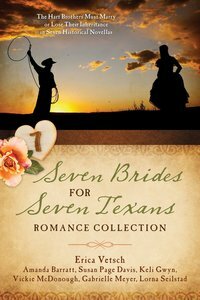 About "Seven Brides For Seven Texans Romance Collection (7 In 1 Fiction Series)"
Award-winning novelist Keli Gwyn is a California native who lives in a Gold Rush-era town at the foot of the majestic Sierra Nevada Mountains. Her stories transport readers to the 1800s, where she brings historic towns to life, peoples them with colorful characters, and adds a hint of humor. She fuels her creativity with Taco Bell® and sweet tea. When she&#8217;s not writing, she enjoys spending time with her husband and two skittish kitties. Lorna Seilstad is a history buff, antique collector, and freelance graphic designer. A former high school English and journalism teacher, she has won several online writing awards and is a member of American Christian Fiction Writers. She lives in Iowa. Customer Reviews For "Seven Brides For Seven Texans Romance Collection (7 In 1 Fiction Series)"
I absolutely loved this book. Although it is seven novellas, written by seven different authors it flows as if it is one complete novel. The characters all flow seamlessly from story to story as though written by one person. Each of the seven brothers have a distinct personality and it is fun to see how they end up fulfilling their father's ultimatum to find a wife. This is a very enjoyable book to read and reread.